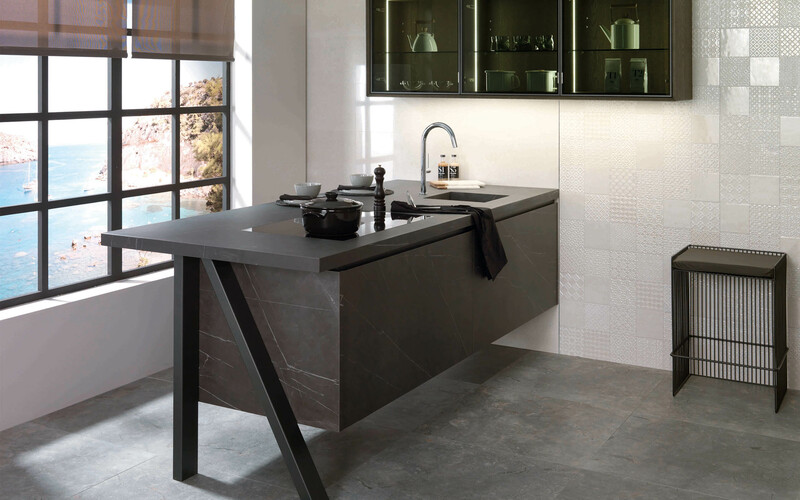 Last week, from Monday 24th to Friday 28th September, the Italian city of Bologna hosted the latest edition of Cersaie, which showcases the latest trends in ceramic tile and sanitaryware products. Yet this event is much more than a traditional trade fair, with architects and designers forging a truly artistic and innovative image for ‘Cersaie’. This year the eight companies that make up the Porcelanosa Group displayed our products on two adjacent stands. 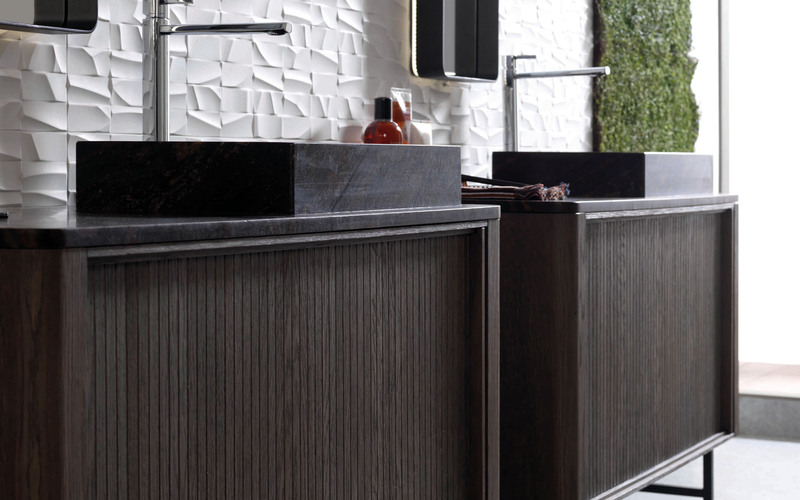 The first featured the Premium innovations and included the Premium Bath Zone and Premium Kitchen Zone. 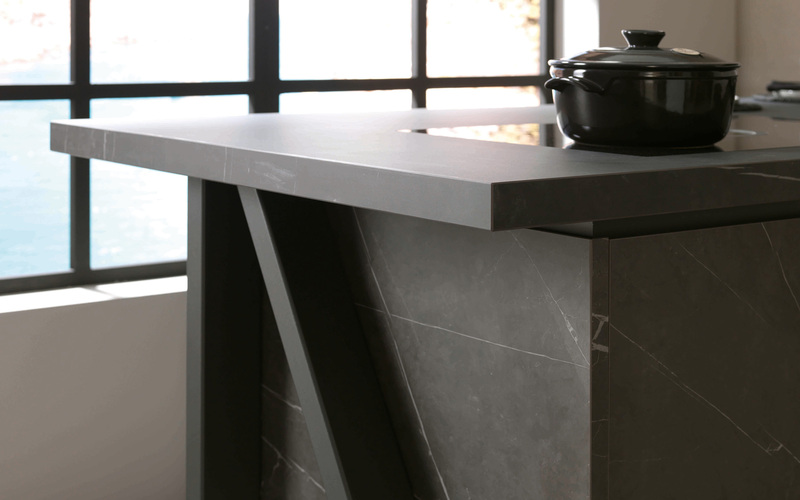 The exhibits included our Premium kitchen featuring a Roble Torrefacto finish and Krion countertop with bevelled edging surrounding the entire island. Other highlights of this kitchen include a section with hidden doors and illuminated shelves for extra storage and work space, as well as the cooking area, with a hob featuring a centrally-positioned extractor hood. The exhibition space also included an area dedicated specifically to integral solutions for single family homes and larger scale projects. The PORCELANOSA Group stand included our Emotions kitchen with X-light on the fronts and countertop, suspended on a wabi leg with a Cien Sable finish, matching the accessories in the backsplash area which also include the same finish. Also on display were our BLIND AND LAST bathroom products. 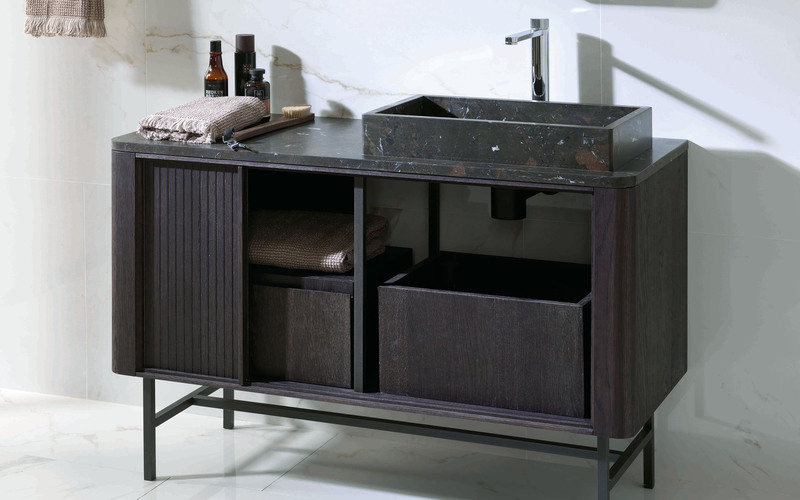 The former is a bathroom unit combining a clever mix of tradition and simplicity, creating a truly unique item of bathroom furniture. A shutter system acts as the door, in a style reminiscent of 1930s and 1940s furniture, but with a revamped minimalist design that brings it right up to date. 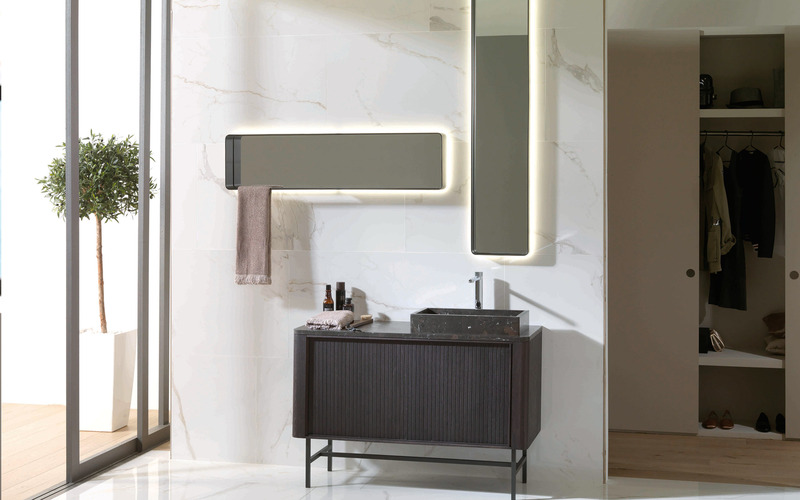 The countertop and washbasin are made of the same marble, adding a sense of distinction. 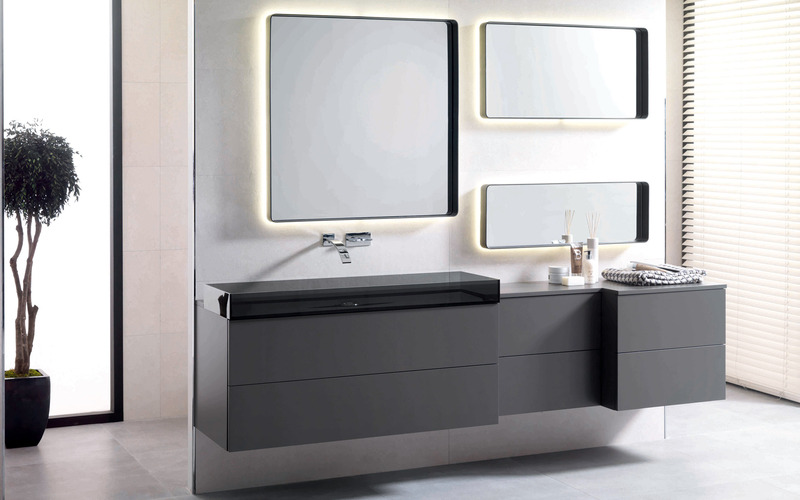 Last is a bathroom unit that plays on varying depths and dimensions, whilst the various modular units create a sense of movement that allows for countless combinations. 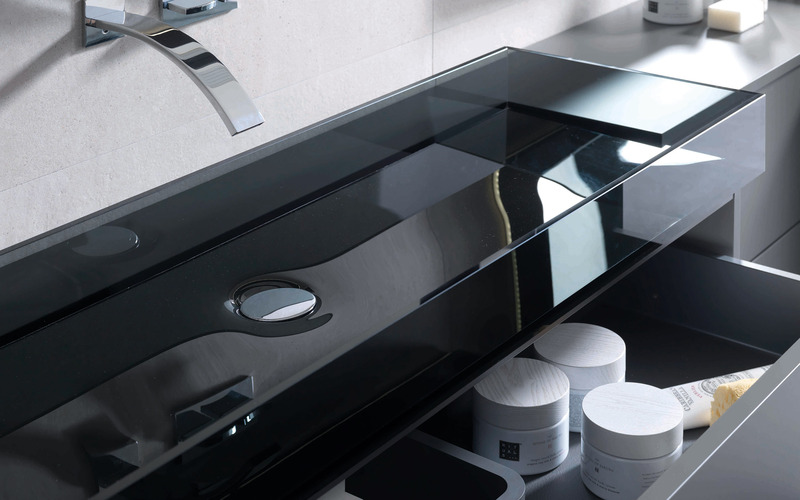 This bathroom unit comes with a large washbasin made entirely of translucent black glass, adding a particularly glamorous touch to the entire unit. 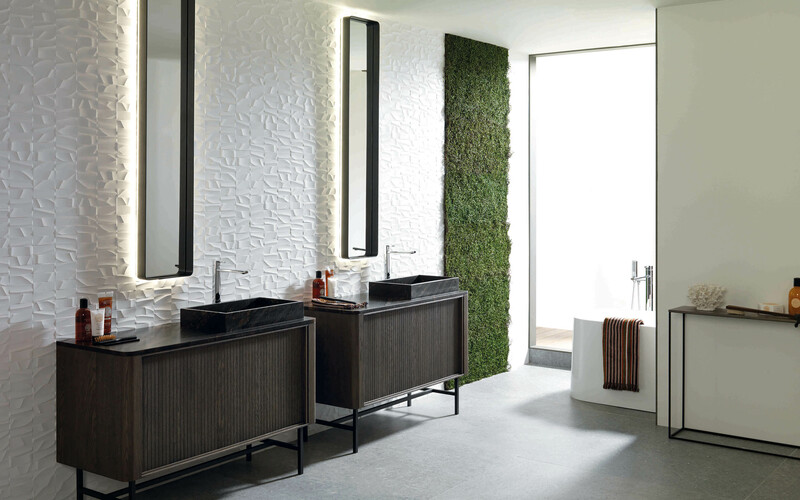 In all, Cersaie welcomed around 111,000 visitors during the course of the five day show. A total of 840 exhibitors from over 40 different countries occupied the 161,000 square metres of exhibition space. In addition to the stands, the event also hosted workshops and talks by some of the sector’s leading figures. Next post: A classic kitchen with ultra-modern features.